Teignmouth. It's the first of a new series of guides, exploring what to see, where to stay and how to find your fun. 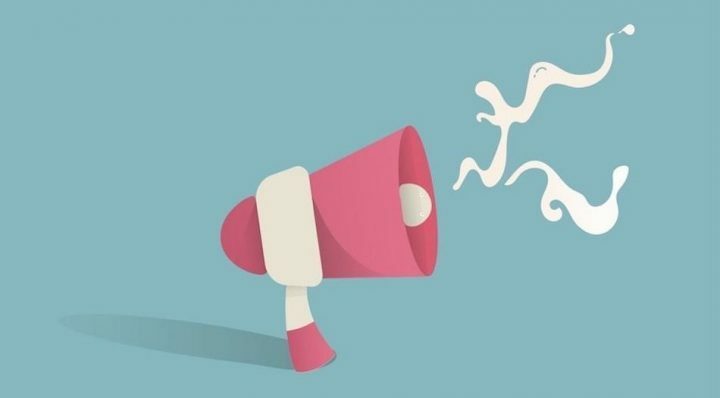 Read, go and do, Muddies! The more I Muddy my way around Devon, the more I’m discovering some great places that I think don’t get shouted about often enough. So in this new little series of guides, my plan is to totter my way around the county, bringing you the Muddy lowdown on how to see and explore our cracking towns, villages and cities. You’ll find under-the-radar spots, those towns perhaps hidden in the shadows of the more visited destinations, plus our take on the hotspots that are catnip for tourists (think quirky, cool and new). We travelled as a family, with a four year-old and highly recommend it as a family-friendly option as there’s so much for kids to do. But Teignmouth has something for everyone and the unique vibe also makes it a great base for a multi-generational holiday. Grandparents will be taken by the nostalgia, while the younger ones will love the indie feel. Embarrassingly, until recently my only real point of reference when talking about Teignmouth was the fact that the band Muse all grew up in town and hit the headlines a few years back, when they returned to perform a triumphant open-air gig. And I’d only ever clocked the place from the train while schlepping to London, as the mainline glides past this coastal town, along with the Shaldon and Dawlish stretches of seaside. But from here it’s always looked an intriguing spot to me, with its pastel-hued houses and fishing boats bobbing on the sea, all the while coated with a gentle vignette of nostalgia. 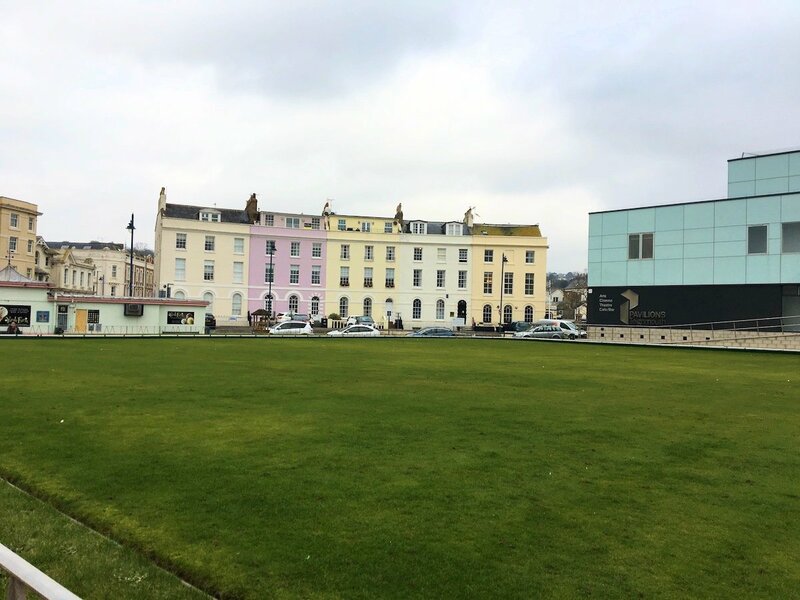 You’ll often see families bimbling along the seafront, making their way between Dawlish and Teignmouth, stopping at the various merry-go-rounds and attractions along the way. 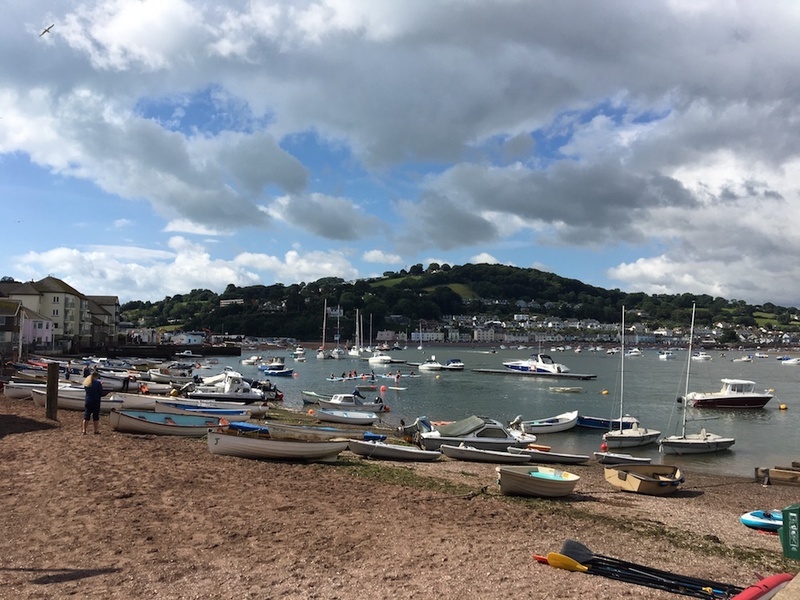 Up close and in the thick of it, it’s a very pretty and historic town sitting just where the River Teign meets the sea, with a strong indie vibe and barely a Costa Coffee to be seen. My photo’s in the God-awful January weather don’t do it justice, but you can wander down streets lined with Georgian buildings adorned with plaques revealing their history, stroll along a glorious Victorian pier flanked with retro amusements, as well as long stretches of sandy beach. You can’t fail to imagine Teignmouth’s Victorian heyday as a fashionable holiday destination. The locals I met love their town and want it on the map. It doesn’t have the same clotted cream, perfectly manicured feel as the likes of Dartmouth and Salcombe further down the coast; but it does have a rugged charm and a boutiquey feel, along with a sense that the beating heart of this town is growing ever stronger. 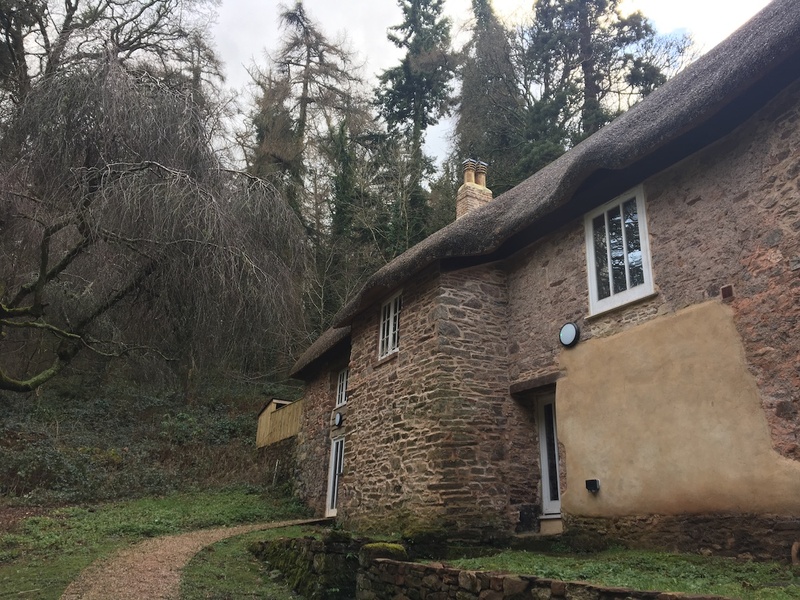 Me, Mr Muddy and the Mudlet pitched up at Orestone House, which is one of two great self-catering houses in town that you’ll find through Holiday Accommodation Devon. It’s a fantastically flexible place to base yourself, because it can be taken as a whole, 4 bedroom house, or split three different ways, depending on how big your party. 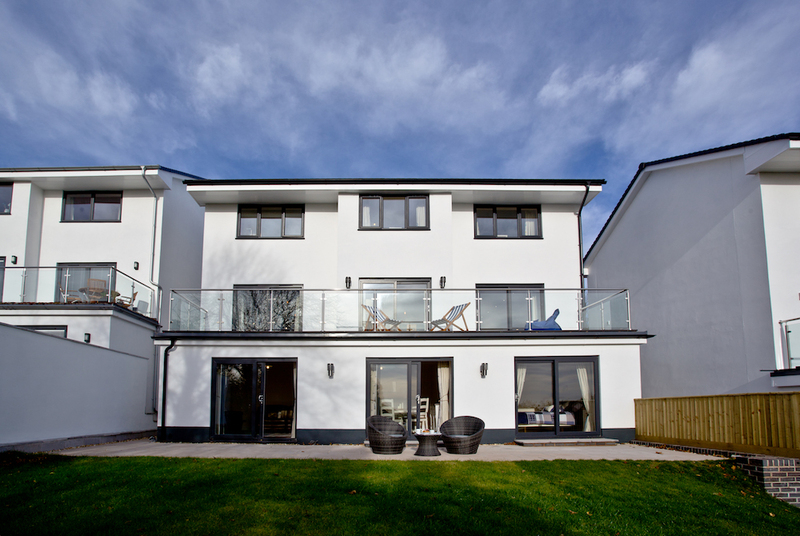 Orestone is a big, white contemporary house, perched high above town with views out to sea. 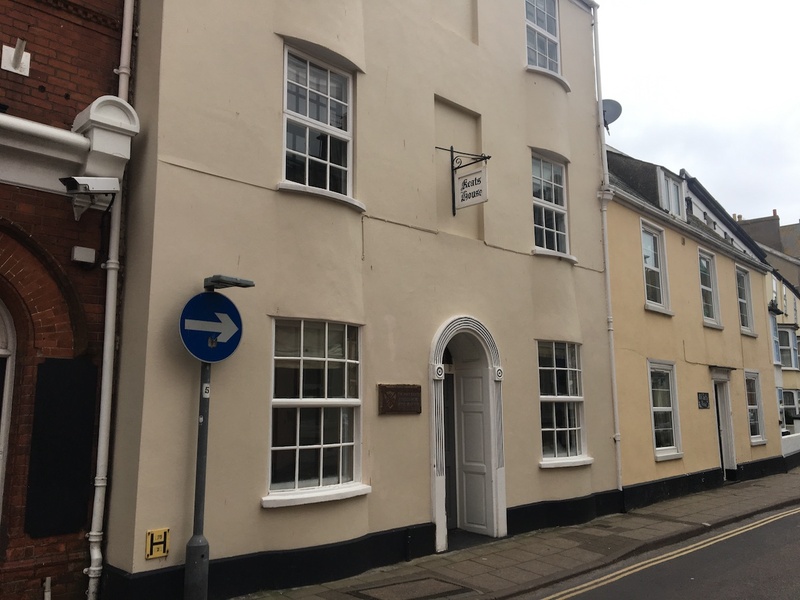 It’s easy to access, on the main Teignmouth road, has allocated off-road parking and is a mere two minutes’ drive uphill from both the train station (on the mainline) and Waitrose, so you’re perfectly positioned to stock up on essentials, like wine and ice cream. We had a good nose around the whole house when we stayed, and had we been a bigger clan we would have loved the open-plan set-up of the whole house; but as just a party of 3 (one being a four year-old), we’d have rattled around the place, so we opted for the cosy one-bed apartment on the ground floor. The decor is clean, bright and modern, with nautical nods to the coastal location. 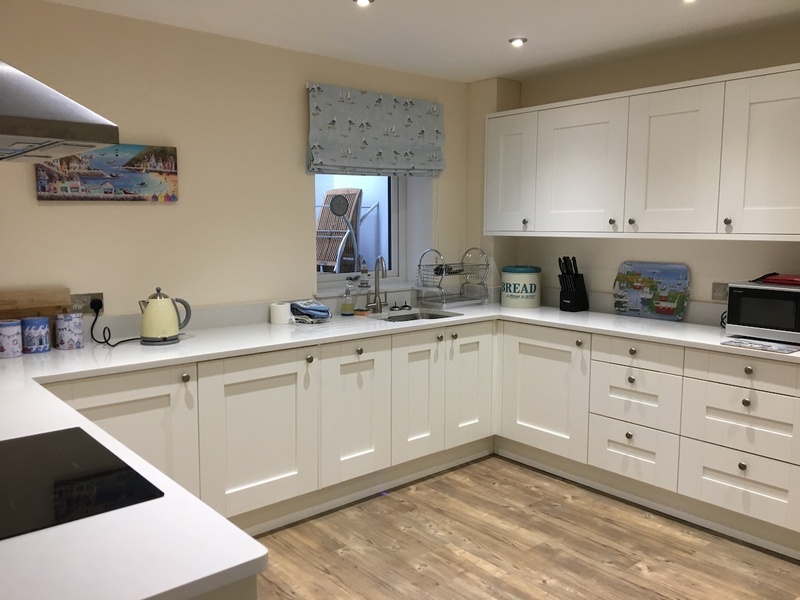 It’s comfy, the kitchen is great, there’s lots of info on the local area and you can wake up to sea views – basically all you’d want from a self-catering stay on the coast. For just a couple of nights, it was a brilliant base for us. This is actually a great town to spend a day in with kids, because there are a plethora of ways to do it, in all weathers. Sadly for us, we managed to time our visit during a month of storms, bitterly cold winds and dreary skies at the best of times. But hey, I’m still managing to write a guide, and that’s testament to Teignmouth’s versatile appeal. 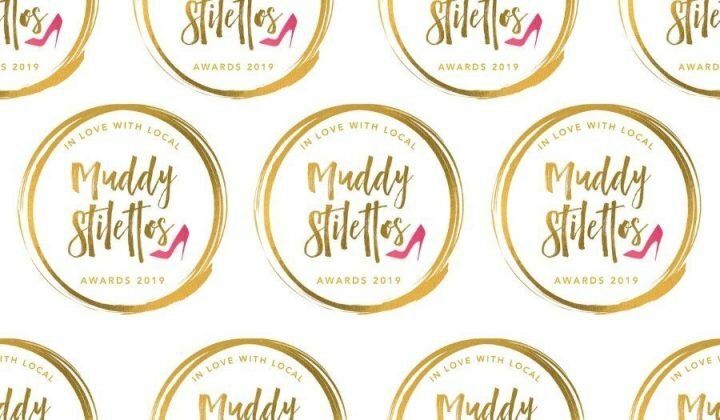 Having popped in and bent her ear, I really have to thank the very lovely Muddy award-winning artist, children’s author and local, Laura Wall, for her encyclopaedic knowledge of the town. I owe much of our highlights to her; here they are, so you can make the most of them, too. 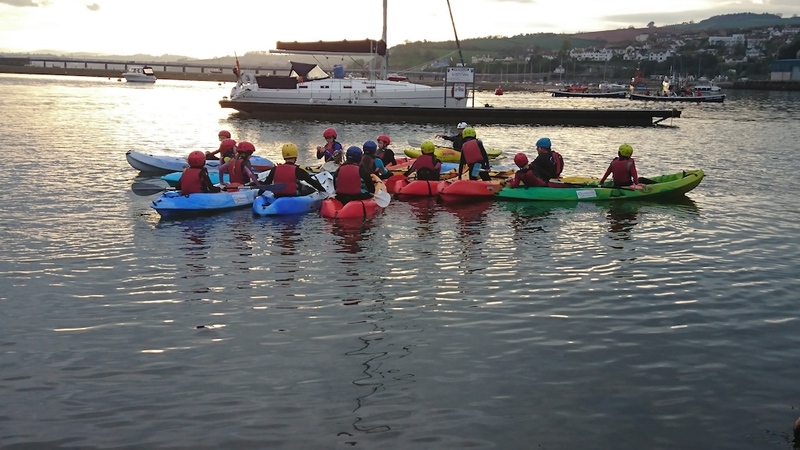 1/ Cross the water and start in Shaldon. 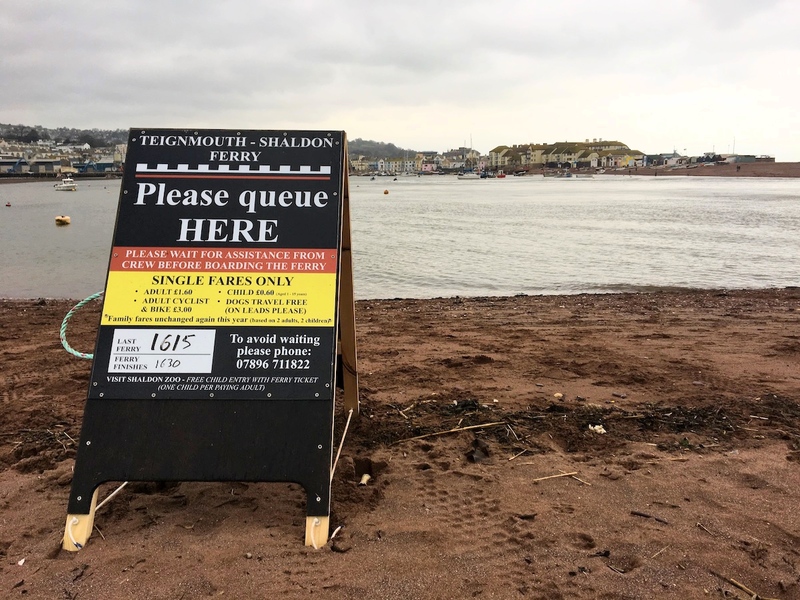 So, a good way to approach a visit to Teignmouth, is to make your way out of town and then work your way back in again; hop in the car and navigate your way over the water to the neighbouring village of Shaldon. Park up nice and early at the Ness for the day, overlooking Teignmouth and kick things off with breakfast at Cafe ODE. If you’ve not yet discovered this awesome cafe, along with several spots in the locality, then I highly recommend you seek it out. The emphasis is on top-notch sustainable and locally produced fare, in a relaxed setting. 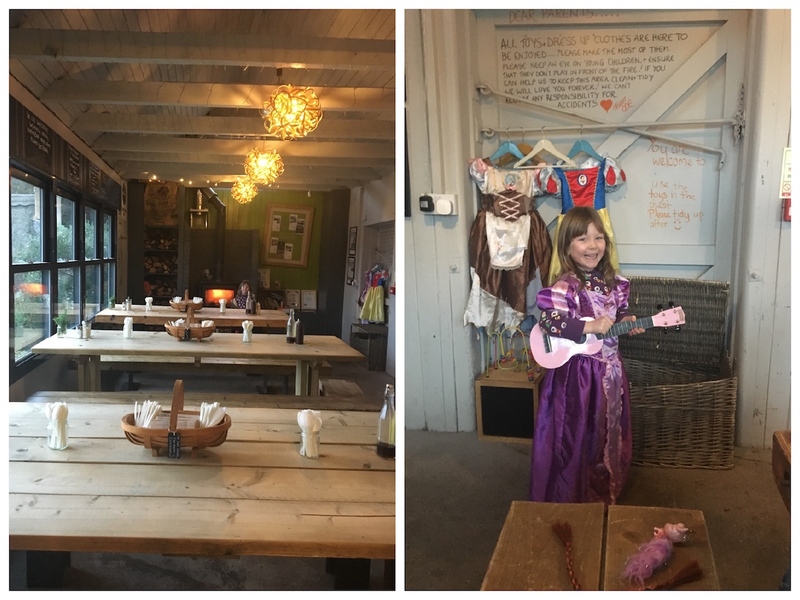 It was a perfect port in the storm for us, with a warming fire, family-friendly vibe, great food and even a children’s toy box. Breakfast in a princess dress with a pink guitar? Winning by 9am. Once you’re sufficiently fuelled, wander down the hill to the beach for a quick stroll around. If the weather’s on your side, you could seek out Ness beach, via an actual smuggler’s tunnel. 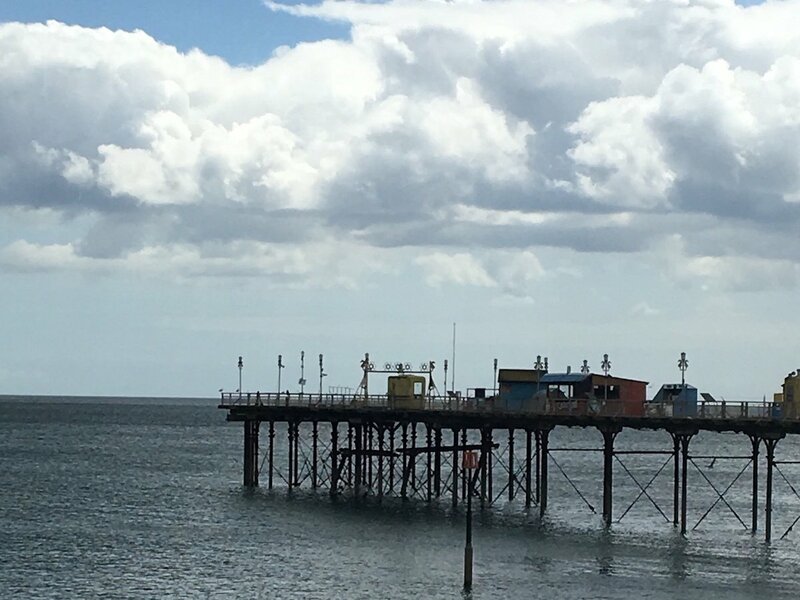 Then hop on the little passenger ferryboat which runs regularly throughout the day, unless the weather makes it impossible, and takes you over to Teignmouth in just a few minutes. It’s England’s oldest passenger ferry and for small people it’s a great, piratey adventure, especially getting on and off (apologies to our fellow travellers, who had to endure the Mudlet chanting ‘walk the plank!’ every two minutes). 3/ Explore the locals’ beach. The ferry lands you on beautiful Back Beach, which feels like the beach that only the locals know about. It’s small, sheltered and lined with a few lovely eateries. 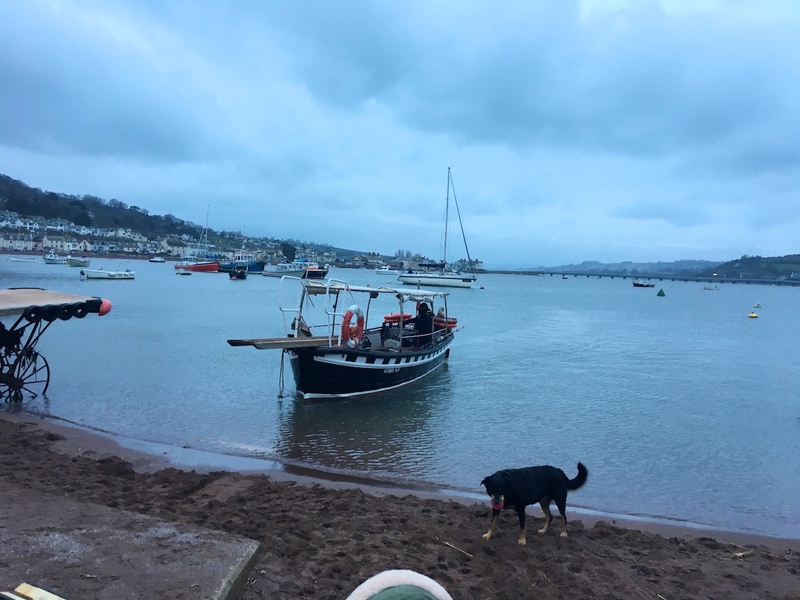 During the warmer months you can dip in behind the beach huts and grab coffee from a little shack called the Teign Canteen, before perching between the boats, looking down river. If it’s closer to nosh-time, then the Crab Shack On the Beach is renowned for its award-winning seafood. It opens from February. 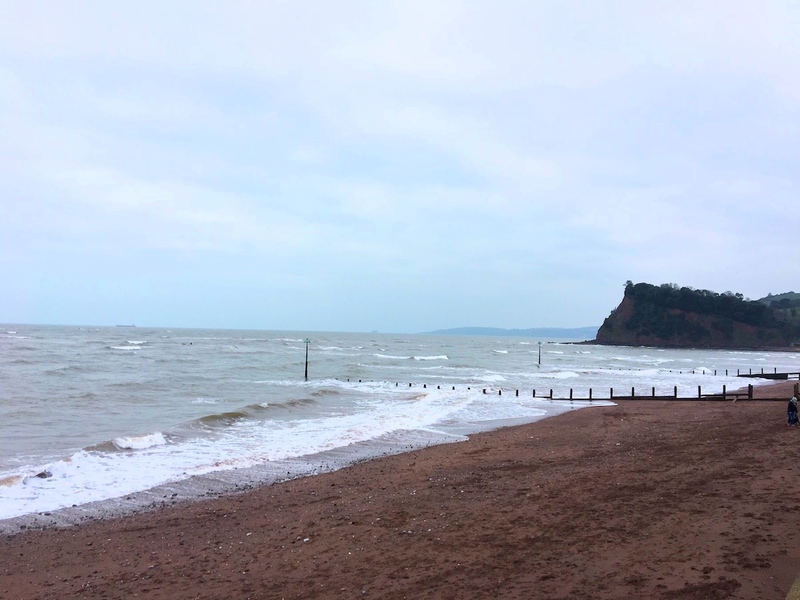 If you’re hankering after more sea air and keen to see more of Teignmouth from the water, then Back Beach is also where you’ll find SeaSports South West, a fantastic family-run watersports centre, offering courses, as well as tasters in all manner of watery disciplines. In the calm waters, try your hand at sailing, kayaking, even stand-up paddle boarding. They’ll kit you out and set you up for a safe and fun sea-based session. For more info, read my review of my SUP Yoga experience here. 5/ Retail therapy in town. From Back Beach weave your way into town through Ivy Lane, or one of the little streets by the Ship Inn and you’ll find yourself on Northumberland Place; this is the Arts Quarter and is where you can easily spend an hour or two discovering the lovely little indie shops that thrive here. If you time it right, you’ll also find the once a month crafts market in Northumberland Place. If you’re an art fan, make sure to pop in to the Reuben Lenkiewicz gallery, showcasing work from celebrated Plymouth artist Robert Lenkiewicz, curated by his son. And, of course, make time to go and say hello to local celeb Laura Wall, especially if you have kids. 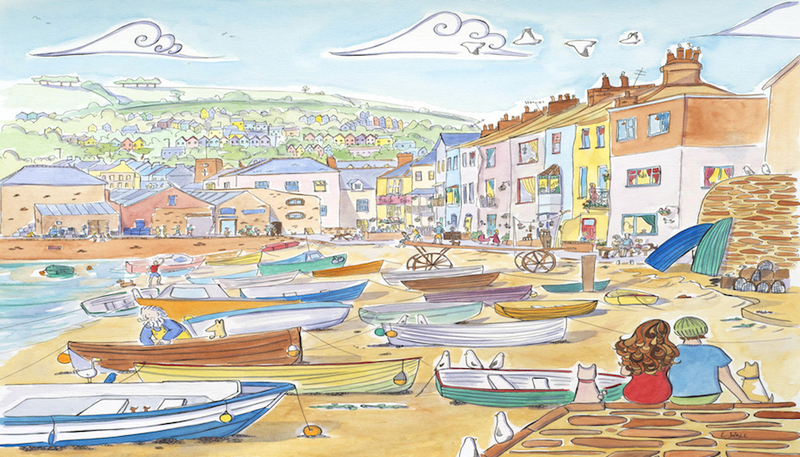 From here, you can view her vivid and vibrant artworks showcasing Teignmouth, among other colourful towns and landscapes; but it’s also the home to the very brilliant children’s story series, Goose. 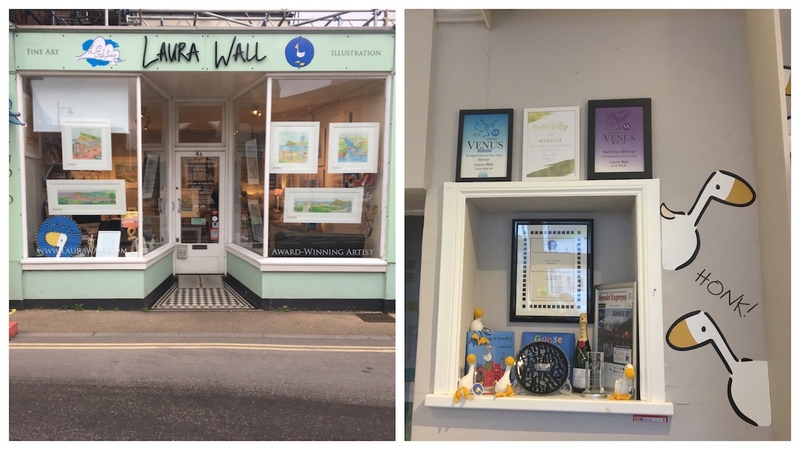 The little character and his companion Sophie adorn the walls and shelves (along with *ahem* a certain Muddy certificate), and there’s a cosy corner to sit and look at the stories with smalls. Another winner for us. Don’t forget to explore the Triangle too, where you may catch a farmer’s market if you time it right; but if not you’ll find plenty more shops and galleries to explore. 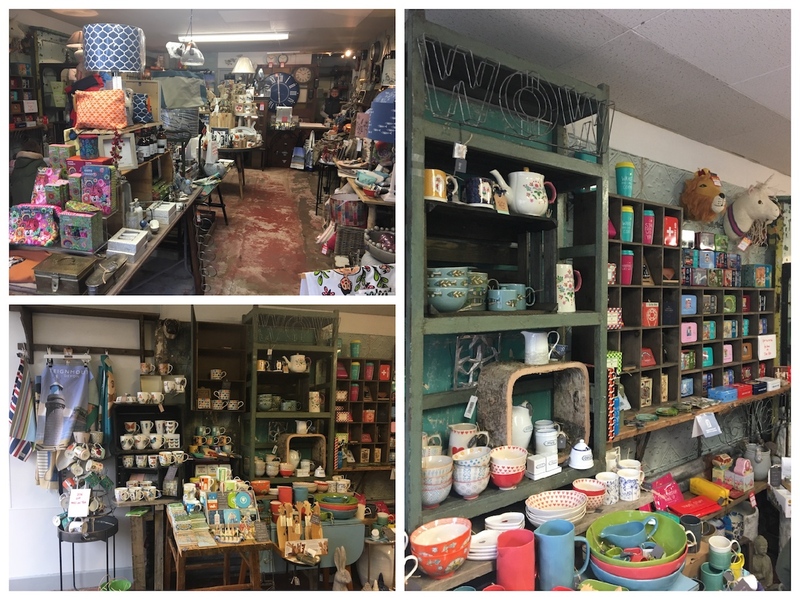 We loved Shop Dead Gorgeous, crammed full of tastefully quirky homewares and gifts. 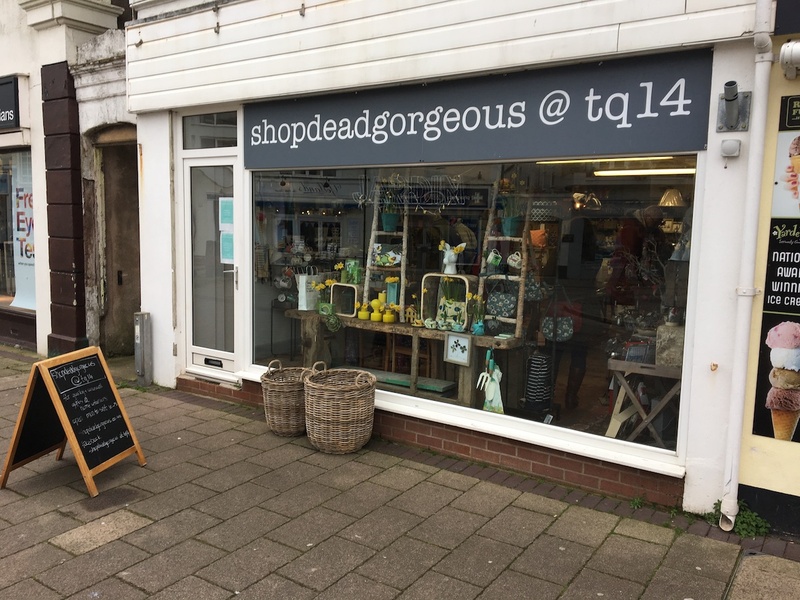 It’s one of two stores in Devon (the other in Exmouth) and is a great place to discover British designers (many local) sitting alongside bigger names. To me, this shop epitomises the friendly, indie spirt of Teignmouth. It’s well worth a visit (and making some room in your case for purchases, too). 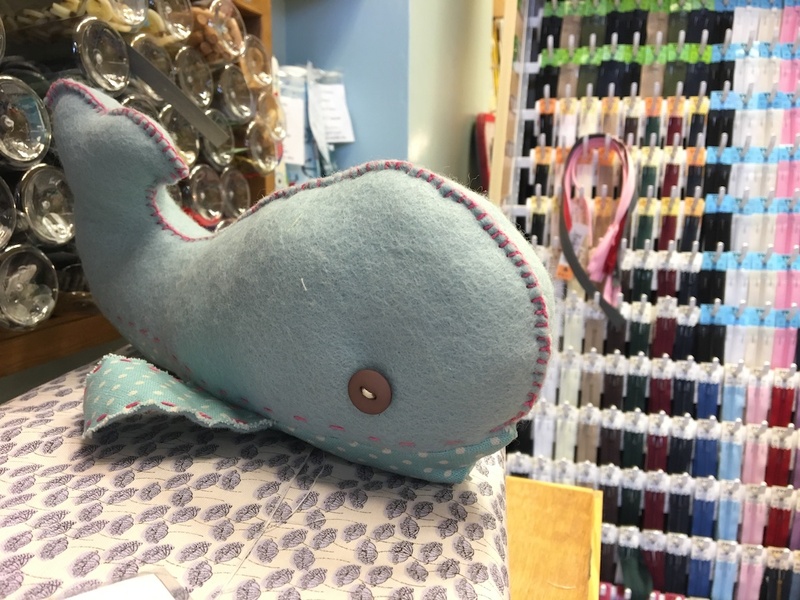 If the weather is raining on your parade, or if you have kids needing to throw their energies into something productive, or maybe you just fancy crafting your own little work of art to remind you of your trip, Sew & Sea is a great little discovery on nearby Brunswick Street. 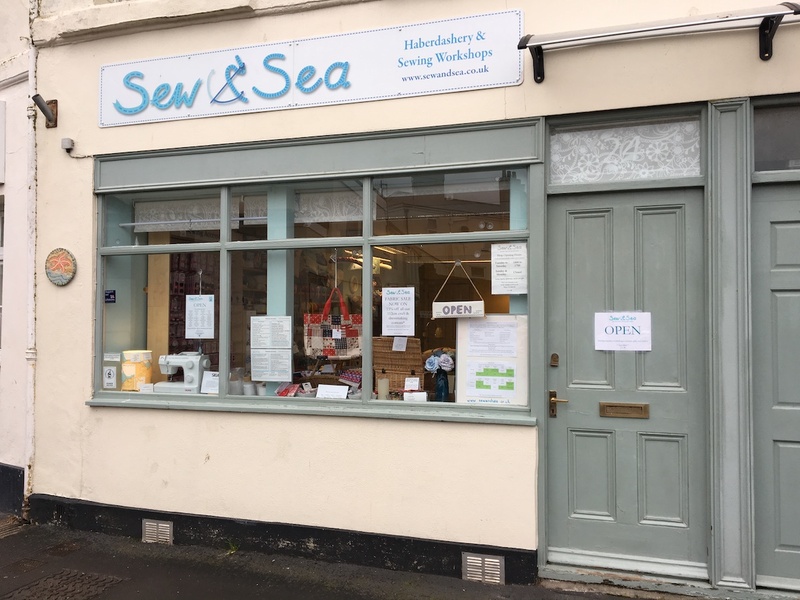 Run by a lovely couple who are simply passionate about the art of sewing, here in a cheerful little shop, you can get stuck into a relaxing sewing workshop, for an hour to an all day sesh. Older kids (under your supervision) will love having the chance to make anything from a pencil case to bunting, or you could even come away with your own new dress. It seems to be a really popular option for visitors to Teignmouth, so check out their workshops online. 7/ Fill up on hot chocolate & cake. When you’re beginning to flag, you’ll find the town’s most calorifically notorious pitstop on the high street. 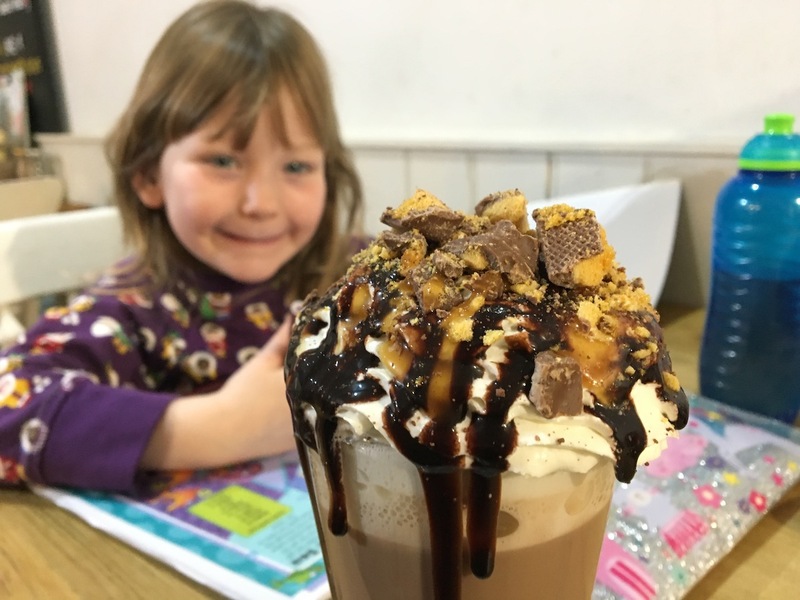 A visit to Finley Brown’s, we discovered, is an absolute must with kids (and dogs). 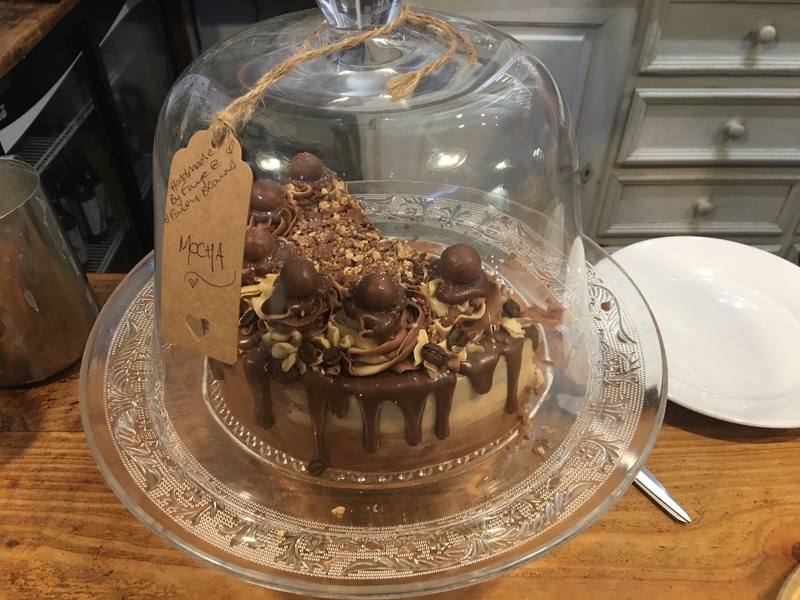 It’s worth following the Instagram page for this place alone, if you’re a fan of towering homemade cakey concoctions, featuring retro chocolates – they’re in-credible. We were on the receiving end of the loveliest welcome in town, along with a ridiculously indulgent hot chocolate and slab of cake. This place was made for rainy days. 8/ And walk it all off again. Keep on strolling and you’ll eventually reach the seafront promenade, which is where things take a turn for the more nostalgic. Open to the elements, on a decent day it’s a joy to slow the pace down and stroll along, admiring the view. For burning off energy there’s a skate park, plus a big green called The Den, home to a fab kid’s play park that really comes alive in the summer months with water sprinklers and bouncy castles. And for undercover fun, The Pavilions is the town’s theatre and film hub, while the amusements will provide hours of entertainment, for as long as you can sustain the 2p slot machines. Teignmouth is on the very stunning South West Coastal Path, so you can pick up lots of information locally on cracking walks out of town. In one direction, you can mooch all the way along to Dawlish, mainly along the seafront, as the trains fly by on one side. Keep an eye out to sea for signs of sealife, too. And speaking of trains, it’s an easy ride into Devon’s capital Exeter, if you fancy a city jaunt, with plenty of activities for adults and kids. Or, head further down the coast to Torbay, taking in the fishing town of Brixham, or the English Riviera’s centre point Torquay. Visit the home of Agatha Christie at Greenway, spend a day at Paignton Zoo, or lose an hour or two in the chocolate box village of Cockington. 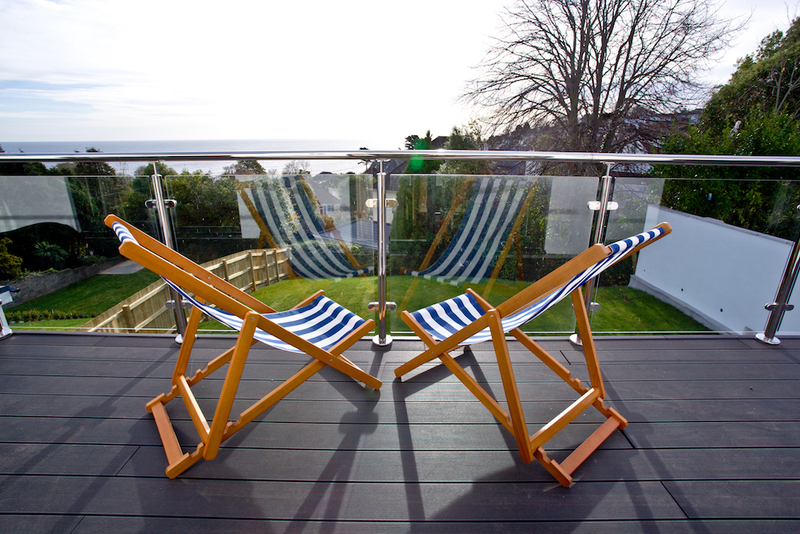 And round it all off with dinner at the chic Cary Arms, overlooking the sea at Babbacombe. 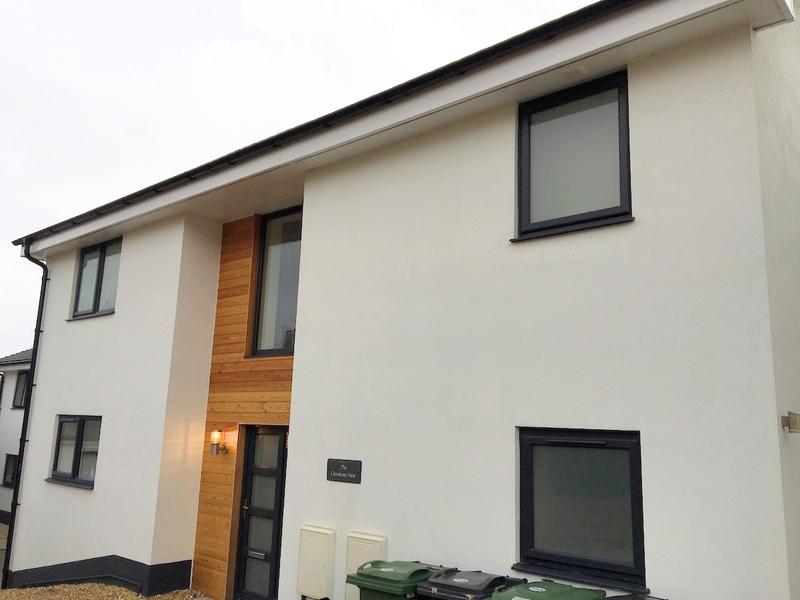 This is an excellent review of Teignmouth, I’m sure there is so much more you could mention. 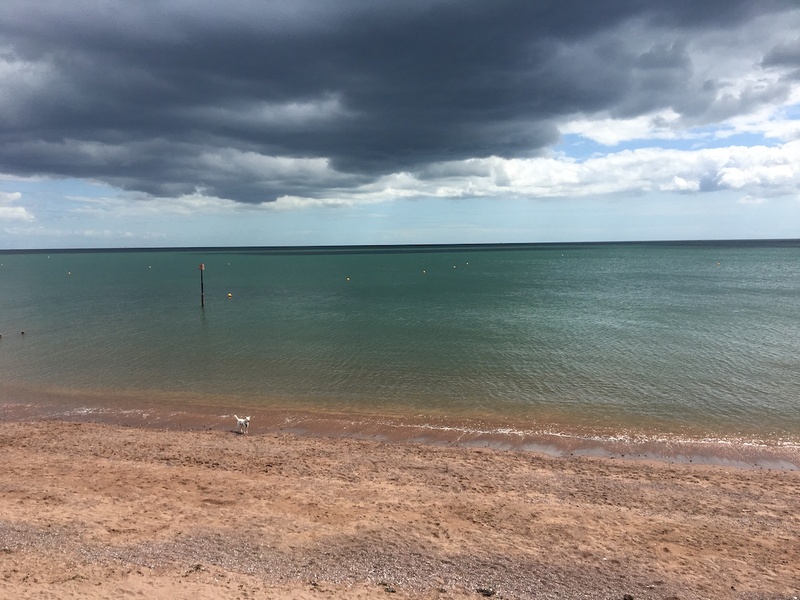 Thanks for such a positive piece on Teignmouth. I am thoroughly lucky to have lived here for 20 years and every day is a pleasure. Good overview from a ‘visitor ‘. 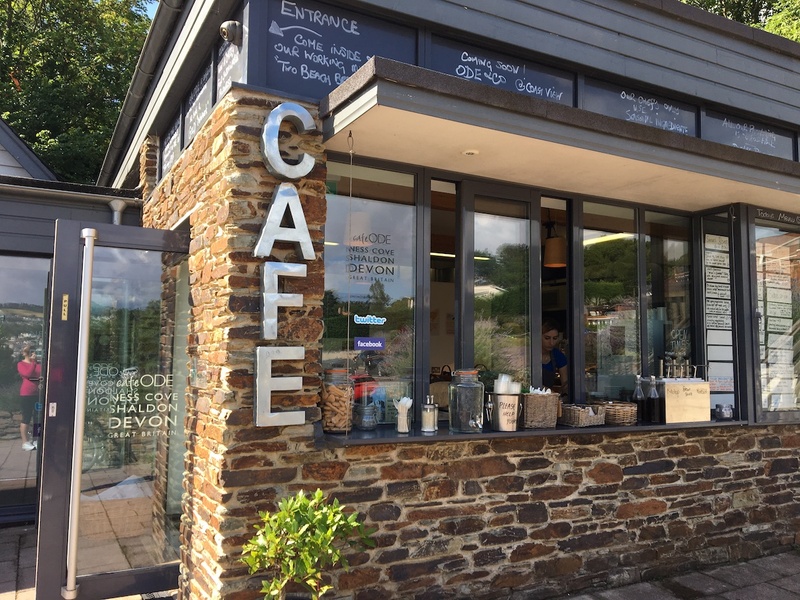 Yes of course there’s more to say.. you can’t cover everything, but the options for eating out have been steadily growing and getting better over the last decade.. including I have to say – Teign Canteen (stunning ‘street food’) near the ferry & Clifford Arms cafe bar in Shaldon. So pleased I’ve found and read this great review. We’ve lived here for nearly 10 years and we used to live in one of the Flats in the ‘Pink block’ in your Walk it off again, piece! I think every day how lucky we are, it’s a gorgeous friendly Town, we love it!